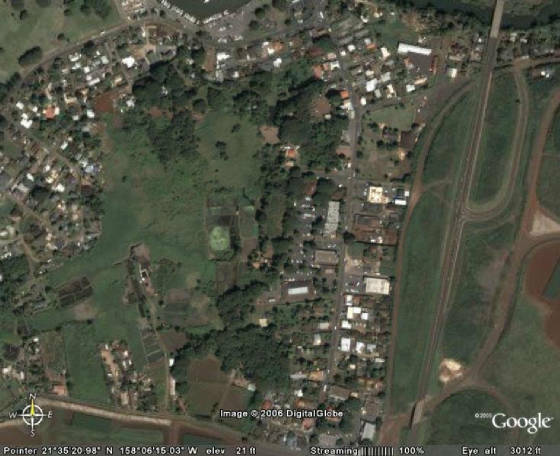 Here is the Haleiwa area. We are in the dead center (kinda hard to see; easiest clue is Robert's area to the left of us). There are three access points we'd love to have. The old familiar one, off Achiu Lane, goes down. The beach walk is towards those closest houses, about 45 degrees to the left of straight up. The one that is probably our legal right of way is toward Kam Hwy, almost due right. Zooming in a little lets you see us a little more clearly. 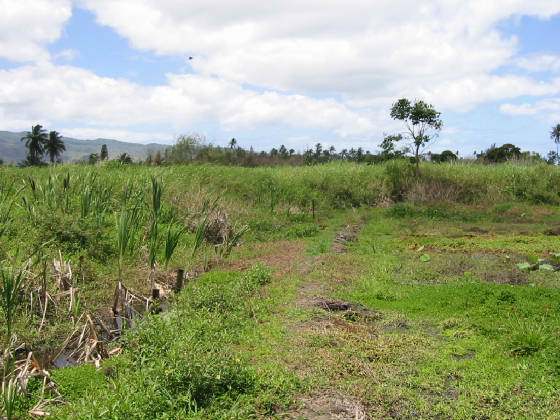 The IGA way goes through a pale green old lo'i. This closeup shows the route between the pale green loi on the left, thru the hasu lo'i on berms, and out to Kam Hwy between Rosie's and Bob's. Same as above but marked up. 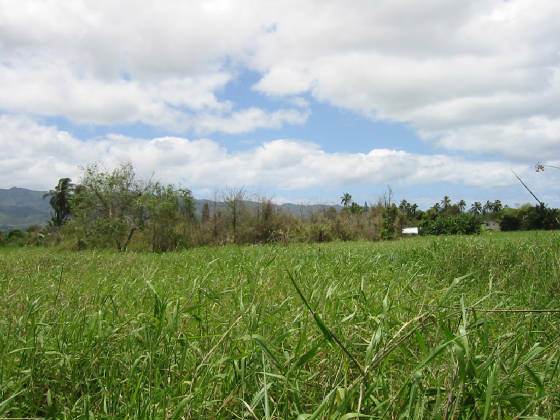 The pale green lo'i has very gooey soil and is our trickiest immediate access issue. Let's walk from the IGA parking lot out to swamp. Right as you cross the old rock wall you'll see signs about private property and dogs. About the time you pass the dogs sign the loose dogs will bark and you have to turn on your don't-bite-me-force-field. 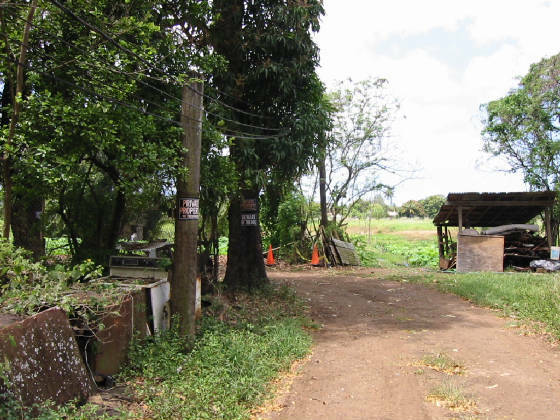 Next you continue straight, on a pathway between hasu lo'i, which you can see off in the distance. 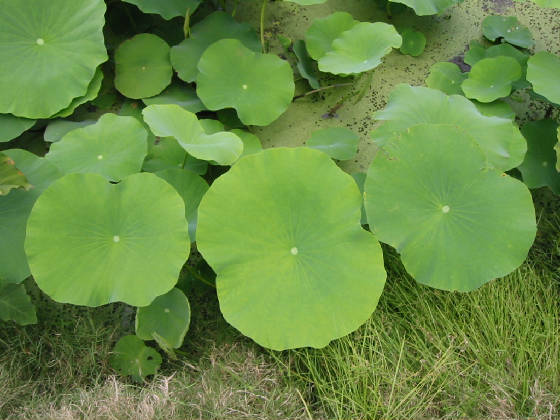 Hasu (lotus) grows in water. 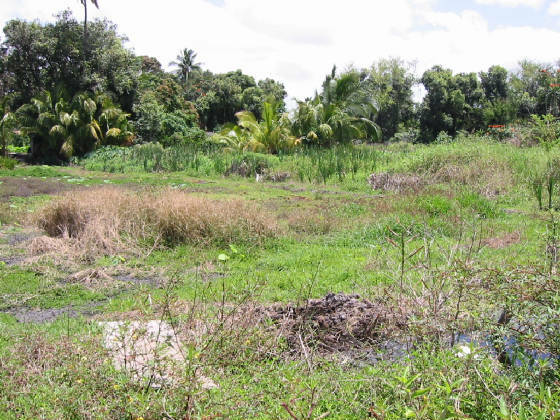 Once a friend of Jim's stepped off of the solid earth path, into the watery lo'i. She sank up to her waist in the muddy goo. 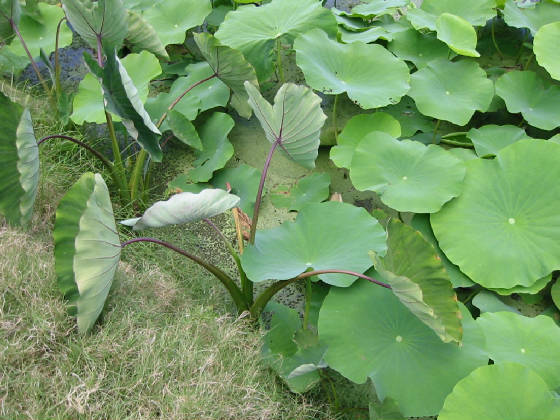 Here you can see the roundish hasu leaves in the background, and arrow shaped taro leaves in the front center. 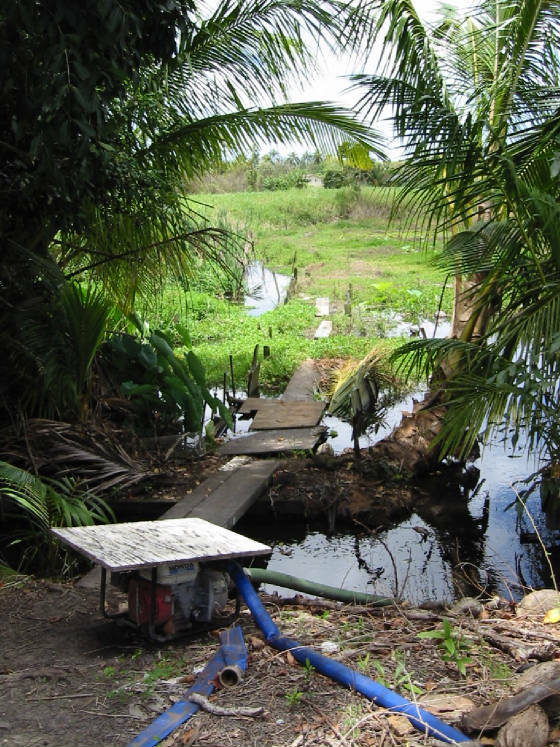 Then you cross a stream on a small foot bridge. 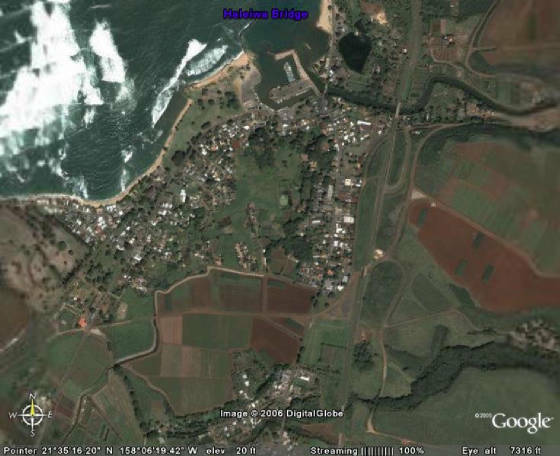 Beyond the bridge is the pale green lo'i. 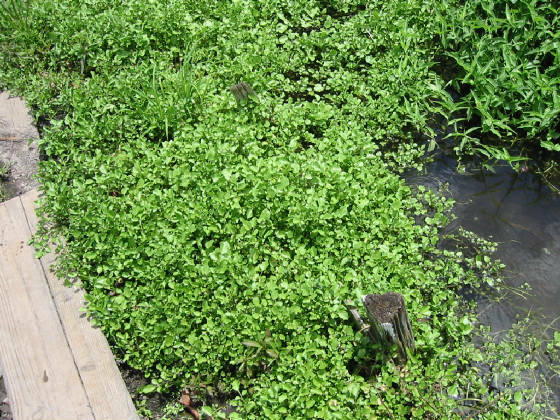 Tasty watercress grows in the stream. There is a berm to walk on, but it is not nearly as solid as the path before. The earth on either side is very gooey. The worst we tread on now is at the end of this berm. There, at about that tulip tree, we turn right, and walk along on almost no berm to about the middle of the lo'i before setting out across the California grass. Right now this navigation point is not marked. It is off to the far right, out of the view of this picture. Things to ponder: Soon we hope to settle on where our right of way is, and improve it. On parts of the route we will almost surely have to build a pathway across the goo. Hopefully we can come up with a design that works. This shot is from where we set out across the unmarked CA grass, but looking back from where we just walked. On the far left edge of the picture the opening in the trees is the little bridge area. 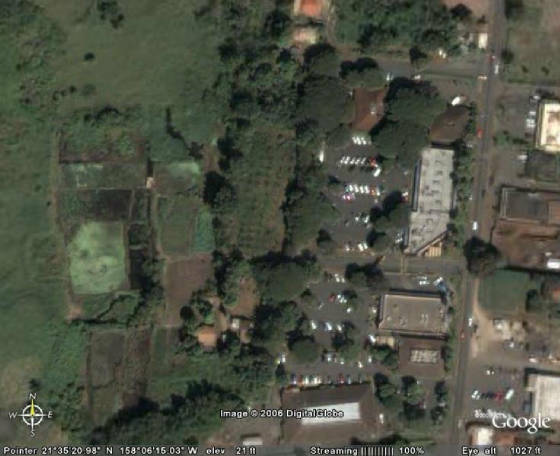 On the far right edge of the picture is the corner of the lo'i where the tulip tree is just out of sight. As you walk across the CA grass, you can home in on our willow tree, on the left in this picture. Our cypress trees are in the center, and Robert's white shade roof is center right.